There are many varieties of chiles that you'll find in grocery stores all over Arizona and the Southwest. Chiles are used often in Mexican cooking, and add a great deal of flavor, and sometimes heat, to the concoction. A gentleman named Wilbur Scoville developed a heat index for chiles, which is the industry standard for measuring a pepper's pain to your palette. For instance, green bell peppers have a value of zero Scoville units, whereas habaneros are rated as between 200,000 and 300,000. Here I'll give you some information about some common chiles you'll come across, and show you a picture, so you can recognize the chile you want for your recipe. You'll find most of these peppers in grocery stores throughout the Valley of the Sun, but you are likely to have the largest selection at a Food City (locally owned and has a focus on Mexican and Latin American foods) or a grocery with a large produce department, like Sprouts Farmers Market. First up is the serrano pepper. It is pronounced: suh-rah- noh. Serrano chile peppers have thin walls. They don't need to be steamed or peeled before using, making it the easiest chile pepper to use for salsas. The serrano chile is green in color at first and ripens to red, brown, orange, or yellow. Serrano chile peppers don't dry well since they are too meaty. It is said to be about five times hotter than the jalapeño; jalapeños are often used as substitutes for their hotter counterparts, the serrano peppers. The serrano rates between 8,000 and 22,000 Scoville units on the heat index. The jalapeño is probably the easiest to find and the most often used at local Mexican restaurants. It is pronounced: hah-lah-pain-yo. Most people think of the jalapeño as being very hot, but it actually varies from mild to hot depending on how it was grown and how it was prepared. The heat is concentrated in the seeds and the veins, so if you want it on the milder end of its scale, remove those parts. Jalapeños are sold canned, sliced, and pickled. Canned jalapeños may be milder than fresh because they are usually peeled and the seeds removed. Pickled jalapeños are always hot. A chipotle (pronounced: chi-poat-lay) is a jalapeño that has been smoked. The jalapeño rates between 2,500 and 8,000 Scoville units on the heat index. The poblano is pronounced: poh-blah-noh. Poblano peppers are mild, heart-shaped peppers that are large and have very thick walls, which make them great for stuffing. Chile rellenos are often made with poblano peppers. Poblanos are usually roasted and peeled before use. Poblano chiles, when dried, are called ancho or mulato chiles. The poblano rates between 1,000 and 2,000 Scoville units on the heat index. The chile de arbol is pronounced: cheel- ay day ar-boll. Chiles de arbol are narrow, curved chiles that start out green and mature to bright red. The arbol chile is very hot and related to cayenne pepper. Be careful during preparation. Arbol chiles are also the ones that are dried after turning red and used in many holiday wreaths. The Chile de Arbol rates between 15,000 and 30,000 Scoville units on the heat index. The habanero is pronounced: hah-bahn-air- oh, or, ah-bahn-air-oh, without the leading 'h' sound. You'll hear it said both ways. The habanero is the hottest chile pepper you'll find in your local grocery stores, and they are very, very hot. The oil in the habanero, as well as many other hot chiles, can be very painful if you get it in your eyes or on open wounds on your hands. Wearing gloves while handling is your best bet. You'll want to watch this video about handling habaneros before you start your food preparation. Unripe habaneros are green, but the color at maturity varies. Common colors are orange and red, but white, brown, and pink are also seen. Most habaneros rate 200,000 to 300,000 Scoville heat units. Yee ha!! That's hot!! A variety of the habanero called Red Savina used to be thought of as the hottest pepper, but it seems that now the Bhut Jolokia holds the Guinness World Record as the world's hottest spice, recording over 1,000,000 Scoville units -- that's almost twice as much as the hottest habanero! The Red Fresno is pronounced: red frez-noh. Red Fresno peppers are similar to jalapeños. One difference is that they are less meaty and have thinner skin, making them very suitable for use in salsas. In the summer, you can purchase the milder Green Fresnos. These chiles are used only fresh; they don't dry well. The Red Fresno rates between 2,500 and 8,000 Scoville units on the heat index. The manzano is pronounced: mahn-zah-noh. Manzano chile peppers are relatives of the hot South American rocoto peppers. They are used most often in fresh form because the pods are so thick they are difficult to dry. These peppers are great for making hot salsas. It is unusual in that it has black seeds. The manzano rates between 30,000 and 50,000 Scoville units on the heat index. 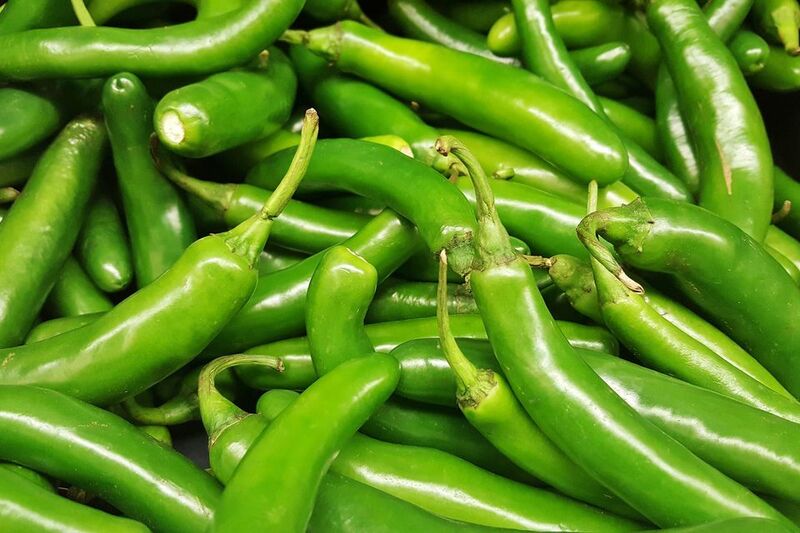 Green chile peppers are large, mild chiles are available in most local grocery stores. The green chile pepper may also be referred to as the Anaheim pepper, and is related to the New Mexico green chile. You slice them, dice them, peel them, puree them; people who like to cook Mexican dishes find many uses for them. They are commonly roasted. The green chile pepper rates between 1,000 and 2,000 Scoville units on the heat index.